When should my child become involved in racing at SHYC? Time on the water is key to building confidence, friendships and community, and translates into having fun! Depending on their interest, students should get involved in club races as soon as possible. While the races are competitive in nature, the emphasis is on fun. How do I know if my child is ready to try her first race? Your child’s coach can help determine whether your child has mastered the skills necessary to compete, and can also help encourage your child. Picking a day with good weather -- especially considering the winds -- is an important part of picking the first race. Coaches are on the water for the races and can assist your child as necessary. What equipment does my sailor need? Children need their own life jacket, gloves, water shoes, whistle, water bottle, and sun protection. Boat gear (sails, rigging, bailers, trailers, etc.) are available at the club for club boats. Check the specific race communications to find out whether food is provided at the race/regatta or whether the sailors will need to bring their own. I see there is an introductory, intermediate and advanced race team. How is each different from the regular sailing classes? In the regular sailing classes (Hermit Crabs, Intro to Optis, Seaman, Mates/Old Mates, Skippers, and O’Pen Bic), students learn sailing skills and are tested on the water to advance to the next level. Generally, the race team levels (Intermediate and Advanced Opti, Intermediate and Advanced 420, O’Pen Bic) correspond to the skill and experience of the child. Being part of a race team is a fun way to practice skills, get a feel for racing, and spend more time with friends. In addition to sailing school race teams, the club has regularly scheduled races throughout the summer for students and members to practice and get time on the water. They are the Tues/Thurs Race Series, Sunday Series, Workman Series, Informal Monday Series and the Ladies Series. These are drop in races but it’s helpful to let the coaches know in advance that your child is racing. Who is in charge of racing at the club? The Sailing School Director and the Head Instructor are responsible for all Sailing School activities. Race Team Coordinator and the Opti and 420 Coaches are in charge of racing activities at the club. There are also volunteer adult Fleet Captains for 420, Opti and O’Pen Bic who help coordinate parent volunteers at regattas. The Rear Commodore, in consultation with the Commodore oversees all activities related to racing at SHYC. We don’t own an Opti, do we need to buy one? No. The club has a fleet of boats that the students can use. Coaches and veteran parents can help navigate the race-day process. Can my child use a club boat for races? Yes. Students who are enrolled in Sailing School or Race Team may use club boats for local series racing and regattas. How long do the races take? Club races usually run 2-3 hours. Regattas can run 6-8 hours (includes lunch and awards ceremony). Club race times are posted on the sailing school calendar. Coaches and other parents can be especially helpful in navigating the day’s events. The Tuesday and Thursday series races and the SHYC Optimist Regatta Green Fleet races are conducted within Stage Harbor and are visible from the deck or dock (binoculars are helpful). Races outside of the harbor can be viewed on private boats or spectator boats (see rules/guidelines for spectator boats). What are the rules/guidelines for spectator boats? Spectator boats should stay clear of the race course, avoid interference with any part of the race and also observe the usual rules of water safety. Beyond this, spectator boats are a great way to observe your child and the race. SHYC welcomes parents with powerboats to volunteer to patrol races, particularly when weekend races were held outside the harbor in Nantucket Sound. Contact the Race Patrol Chair for information on how to be involved. My child wants to work on sailing skills, is there an opportunity to enroll her/him in additional private or group lessons? Yes. Many of the sailing instructors offer private or semi-private lessons. These are sometimes posted at the clubhouse but feel free to approach your instructor directly. This is a wonderful opportunity to help build your child’s confidence before their first race. My child would like to practice skills, what are the opportunities to get more time on the water? In addition to sailing school race teams, sailors can compete in the SHYC Tuesdays, Thursdays and Sundays Series races during the summer. What is the difference between club races and regattas where the sailors travel to other clubs to compete? 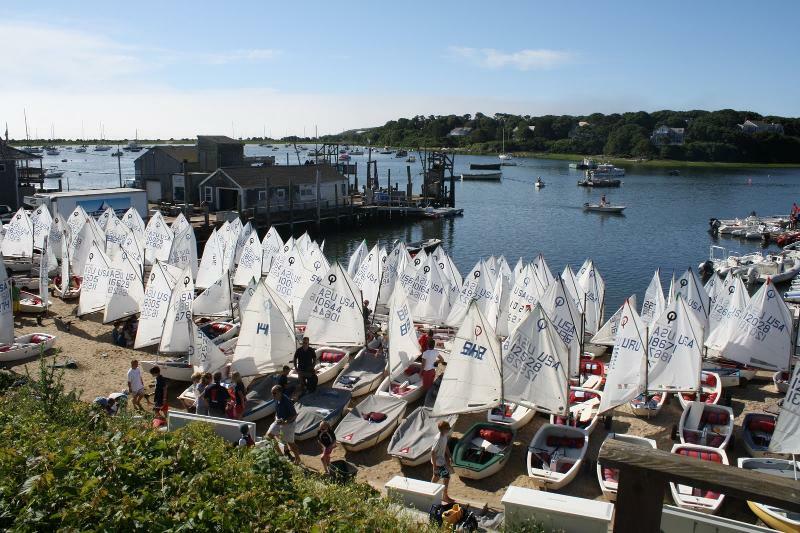 What is an SHYC sanctioned regatta? An SHYC sanctioned regatta is a regatta that has been approved for SHYC participation. SHYC will supply coaches, club sailboats and transportation of boats (420 class), as well as a Parent-In-Charge. Parents are responsible for arranging transportation of their children and boat “gear” to and from regattas. How do I know if my child is ready to try her/his first regatta? Your child’s coach can help determine whether your child has mastered the skills necessary to compete, and can also help encourage your child to participate. What are the different fleets within Opti regattas? Opti regattas are usually divided into 2 groups of sailors: experienced (White, Blue and Red fleets) and novice sailors (Green fleet). Green fleet competes separately and consists of new sailors of any age up to 15. White (10) Blue (11, 12) and Red (13, 14, 15) fleets race together as a group but are ranked separately within each fleet. Does my child need to be on a race team to participate in a regatta? The regattas at other yacht clubs look like a big time commitment for sailors and families, can you explain the logistics to me? Away regattas are generally a full day event. They generally involve loading boats at SHYC the afternoon before race and then will usually take the majority of race day. Parents usually meet between 7-8am on race day and commute together with the boats and coaches. While parents are welcome and encouraged to attend the races, their presence is not required; however, they are required to coordinate their child’s transportation to and from the regatta. The Parent-In-Charge, coaches and other parents can help manage the day’s events. Parents of children who actively participate in regattas are encouraged to volunteer for PIC duty one or more times during the summer. My sailor is signed up for his first regatta but the wind is strong, how do I know he’s ready? A positive experience at your child’s first regatta goes a long way! Your child’s coach will weigh in as to how they think your child will handle the wind but ultimately, your child should feel excited and confident about sailing. Being nervous is normal, being scared is something else. Coaches are on the water to help. Is there someone from SHYC on the water and on land at the regattas? Yes. There is at least one SHYC coach boat at sanctioned regattas and a Parent-In-Charge volunteer on land. Do parents stay for regattas? Parents are encouraged to stay, particularly for Green Fleet, but don’t have to stay for regattas. It’s important to make sure that you carry your cell phone so that you are accessible to the coach and Parent-In-Charge. You are responsible for transporting your child to and from regattas and providing lunch for your child if necessary. However, there is a strong sense of community around regattas and other parents are often able to help. What is Regatta Network? How does it work? Most regattas require registration using Regatta Network.http://www.regattanetwork.com/ Follow the instructions on the website to set up an account and access regatta registrations. What if my child is using a club boat and I don't know his/her sail number? Regattas track sailors according to their sail number so it is important to write it down before sending your sailor off to the races! In the event you do not have the sail number SHYC staff and the parent in charge will be able to help. How do I get my child's boat (or club boat) back and forth to the regatta? Each sailor is responsible for making sure their reserved boat is tied onto the club trailer the afternoon before the regatta; the coach will announce when everyone should meet to tie the boats down. You are responsible for bringing your sailor and their gear, including the boat gear (spars, bailers, trailer, etc. ), to and from the regatta. Sailors are also responsible for helping to remove their boat from the club trailer at the club at the end of the day, and make sure that all club boats and gear are stowed and ready for class the next day. I'm not able to attend the regatta. Can/should my child still participate? Parents that are unable to attend need to coordinate with another parent to arrange transportation of their child, their child’s boat and boat gear, to and from the regatta, and relate the arrangements to the coach and/or the Parent-In-Charge. Parental attendance at regattas is encouraged especially for younger and less experienced sailors. What are the parent volunteer activities needed to support racing at SHYC? Help loading and unloading boats to sanctioned regattas - each sailor is responsible for bringing all associated gear to the regatta and loading and unloading his or her reserved boat prior to and following regattas. Volunteer at the SHYC regatta - Adults help register guest sailors, make sandwiches for guest sailors, assist and direct as needed, provide hospitality. Transportation - parents are responsible for transportation of their children to and from club races/regattas, and notifying the Parent-In-Charge when they leave the regatta with their child. Parents can assist with loading, unloading and transporting of boat trailers to and from regattas. Lunch - parents should check with the Race Team Coordinator or the regatta website to see if lunch is provided at specific regattas. If not, they should make sure the child packs a lunch. Fleet Captain for Opti, 420, O’Pen Bic - Parents can volunteer to serve in the important role of coordinating other parent volunteers for regatta activities. Race Patrol - Parents can volunteer to serve as safety patrol during races and regattas. I'm not able to attend the regatta. What may I do to still contribute/help? Help loading boats the day before, unloading boats at SHYC at the end of the day of the regatta. Volunteer to be PIC at another regatta. It all evens out! There are numerous opportunities to contribute to the SHYC racing community. The inability to help out for any particular regatta should not discourage your child’s participation. Are there races or regattas for O'pen BICs? Yes. They are knowN as “UnRegattas”. See the club calendar and Fleet Captain for more information about regattas which host O’Pen Bics.